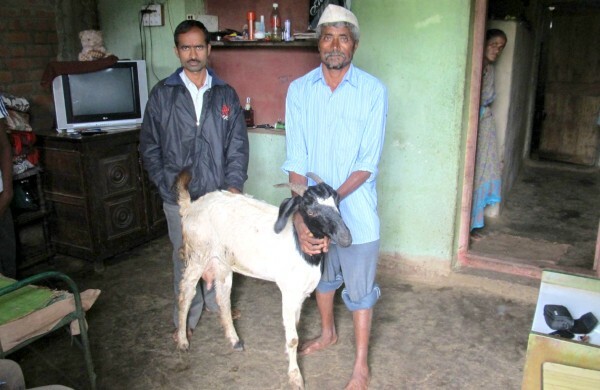 Here is an astonishing’ story of a goat which saved its owner from the grips of furious leopard at Nandihalli village (22 kms from Belgaum) in Belgaum taluk on Wednesday. Rani (name of goat) gave an unexpected blow to the leopard, which made it run leaving me alone, said its proud owner (Shepherd) Ninjappa Chougule of Nandihalli. Speaking to AAB Chougule recalled the incident when he had let his goats to graze near to the border of the forest near the village. A leopard along with its 2 pups gave a surprise attack on the herd of goats. The pups were big enough to hunt. The adult leopard could easily hunt his prey and I was helpless. But I could stop one of the pup which had caught the neck of one of my goat in its jaw. The young pup of the leopard was not ready to leave the goat nor was Chougule giving up his goat. Irked at this the wild cat pounced on him. Chougule said that he used thick woolen blanket to protect from rains, to avoid the leopard from injuring him. As he succeeded to put the mat on his face, he saw Rani(Goat) hitting hard the leopard with its head. She had taken a long run and rammed the leopard so hard that it literally was thrown away. Surprisingly the leopard ran away and the Goat came as the Saviour for Chougule. The goat Rani should be named as Jhansi Rani or Kittur Rani fighting the leopard! A compassionate experience ……..this clearly shows nature is for all……. For a leopard the goat was a hunt to satisfy its hunger, for a goat it wanted to save its shepherd b’cos he who has taken care of it…..and for a shepherd its his care to the goat & nature saved his life…. So we all need to leave in coexistence with nature. Thanks to AAB for sharing the story.